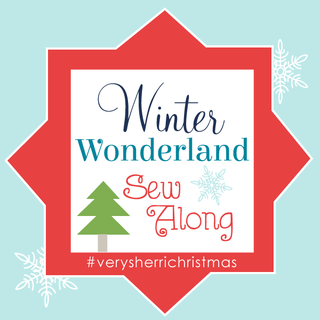 I am super excited to be a part of the Winter Wonderland Sew Along. 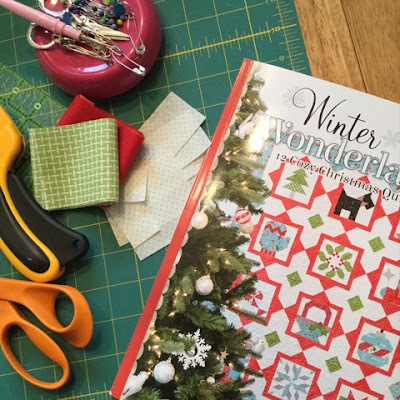 The Winter Wonderland Sew Along is the Sleigh Bell Sampler. Each week you make two of these adorable blocks!!! If you have just discovered this sew along, the book can be purchased at the Fat Quarter Shop. Sherri asked me to participate while we chatted at quilt market this spring. I thought...I will have plenty of time to make a block or project. My Block is #5 the Wreath. and Lecien basic white with aqua dots. Cutting was simple...small pieces for sure with some 1" x 1"! I adore how my block turned out. 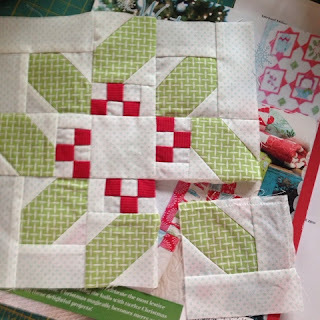 Sherri is sharing the block construction on her blog here. A few commented that my block was constructed incorrectly. I frogged it at 7 am and re-stitched it. While I was stitching the block I had a ton of trouble with my sewing machine. I guess I wasn't paying attention to my block placement. The improved block looks great! I would like to turn this into a potholder for the holidays. I thought for sure I would have had time yesterday to quilt it and bind it. I was unpacking fabric bolts and cutting a bunch of bundles. I'm giving away a fat eighth bundle of the new Ella Blue basics - 37 prints! I will draw on August 17,2015.
p.s. I have 30% off Back to School sale in my etsy shop! Gorgeous bundle! Thanks for the giveaway. Isn't there a wee mistake in piecing the bottom left hand corner? Thank you for the giveaway. This are wonderful fabrics! Thanks for this giveaway. The block would make a cute potholder. I love the fabrics in the giveaway. Gorgeous. Thanks for the chance to win. Gorgeous fabrics!!! I've been enjoying your blog! Thanks for a chance to win some great fabrics. No fun ripping things out-I was doing that myself yesterday! but your block turned out really nice! This is a wonderful wreath and I have never heard the term 'frogging' before so thank you for that!!!! Such a generous giveaway - happy Saturday to you! Thanks for the chance to win! I really like the Ella Blue basics! I admire your ability to frog at 7 am - I have zero abilities at 7 am! Hi really like your block ! Thanks for a great giveaway ! If you hadn't pointed it out, I wouldn't have noticed the blocks was wrong. :) Such a cute pattern; I can see it as a pot holder, too! Great block. I love the cheerful bundle. 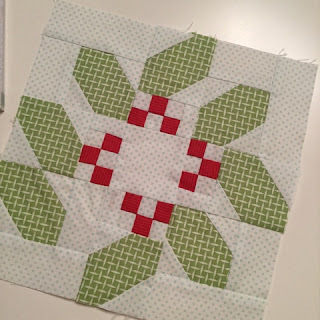 I love your wreath block too! I'm thinking I'll make several of them and sew them together into a table runner for the holidays. I totally understand sewing machine frustrations...ugh! I've torn out many partial seams too and restitched blocks. Sometimes I know it isn't right, yet can't see how to fix it...now that's frustrating! Your block will be a super pot-holder! I think a potholder will be darling! Note to self with this idea. Thanks for sharing the giveaway. Looks like a fun block to make! Thanks for the giveaway. Can't wait to make the wreath block. The fat eighth bundle is beautiful. Thanks for the giveaway. Love the bundle! Thank you for the giveaway! What a generous gift. I haven't even started. Seems like a winter project. Too busy canning at the moment. 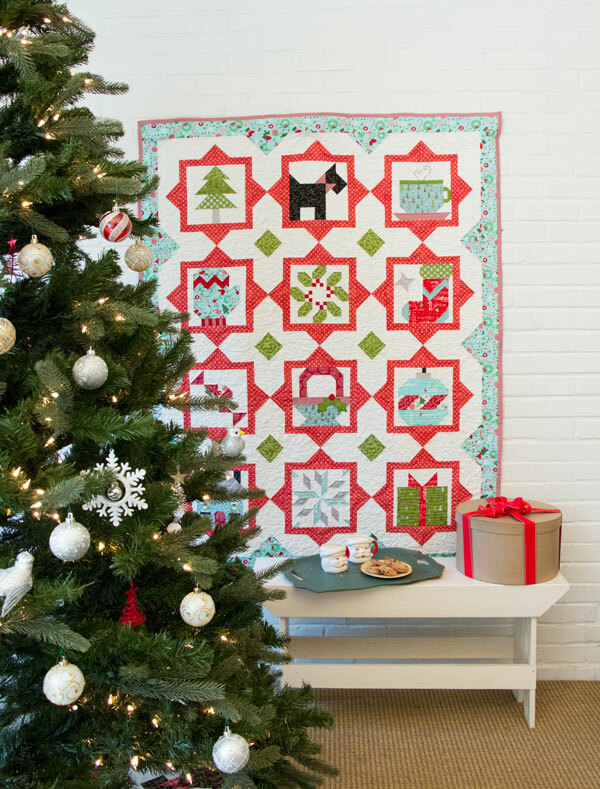 The blocks in this quilt are so pretty; I want to make it. Thank you for the giveaway. I really like those geometrics! Very generous bundle. Thanks, Vickie! I never would have noticed your error in the block. It is so cute, right or wrong! Fabrics are great colors. Sincerely, Paula K.
Love this bright, happy fabric. Thanks for the chance to win. I just bought the book yesterday, and found the quiltalong today. Perfect timing!! 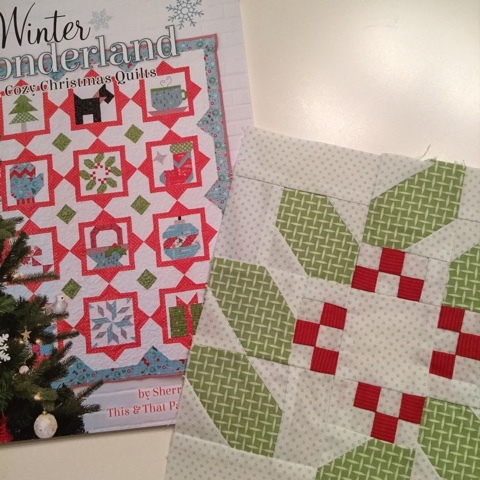 I have the book, but haven't been doing the sew along. I love the fat eight bundle, what a great giveaway! I would love to have this bundle. I love when you can buy bundles of fabric that all matcj. Wow! Thanks for the great giveaway. That is a great bundle of basics. LOVE your block! 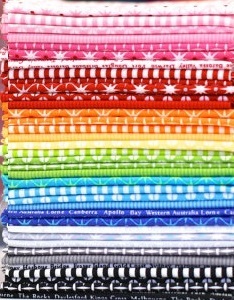 Thanks for the chance to win this fabulous bundle of fabric! What a fabulous giveaway. I love the bundle you are giving away. Beautiful fabric, thanks for the chance! 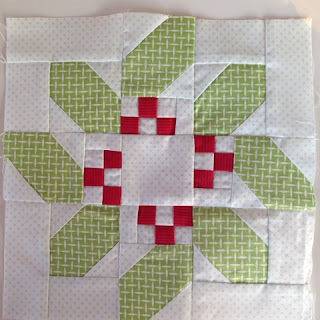 Cute wreath block. Thanks for a chance at this great giveaway. 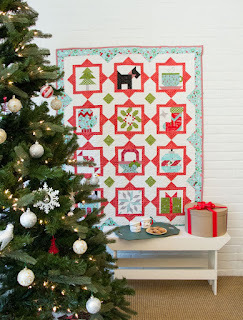 I just saw your blog on the bottom of my bloglovn app and spotted this wonderful quilt! Love this block and it would make such a cute potholder. Especially if some yummy cinnamon scent was added inside. A cute Christmas present for sure! Love the block Thank you for sharing a Rainbow. Love to see mistakes, I don't feel superior but they do make me feel that my mistakes are just part of the learning curve. Love the bundle. It is gorgeous. Thanks.